Chanteur Country US né James Clell Summey, le 11 Décembre 1919 à Near Sevierville (Tennessee). 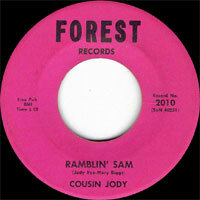 Cousin Jody est décédé le 17 Août 1975. Cousin Jody (real name Clell Summey, Dec. 11, 1919-Aug.17. 1975) was a virtuoso on dobro & lap steel, but is better remembered for his comedy and novelty material. He was in the music scene of Knoxville, TN in the 30`s where he got aquaintted with Roy Acuff becoming his first dobro player. 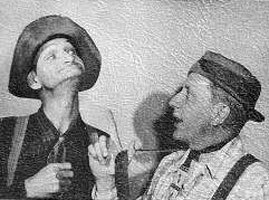 They wound up auditioning for WSM`s Grand Ole Opry I believe first in 1937 some time. Apparently they didn`t pass audition and had a second chance later. Seems that most of Roy`s band (including Jody) wanted to go in a more "pop" style direction than Roy cared for. 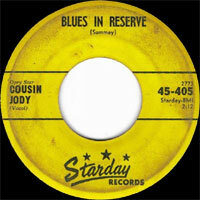 They went to the Opry with plans behind Roy`s back to desert him as they went on stage, but Jess Easterday (one of Roy`s band members for several years) warned Roy of what the others had planned and had another band secretly lined up (including Lonnie Wilson who played rhythm guitar, Pete "Oswald" Kirby on dobro and keeping Jess Easterday on bass) and when they were ready to go on stage the "new band" just crowded out the old members and went on with Roy and left the old band just standing left alone in the wings. So now Jody was out of a job and started playing for Pee Wee King. I believe about this same time is when he switched from the dobro to electric lap steel, which was better suited to Pee Wee`s musical styles. I don`t know how long he played with Pee Wee King, till the mid to late 40`s at least. After playing with Pee Wee King, I think he was a solo act awhile till him and Lonzo & Oscar joined up and this is where the comedy & novelty stuff really started. They were hilarious and if you`d like to see them in action there are some clips on You Tube a person can search for. 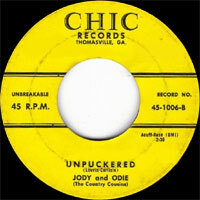 After Lonzo & Oscar Jody was pretty much a solo novelty act (with some different occasional partners such as Oral "Cousin Odie" Rhodes on bass, which had toured some with Roy Acuff in the 40`s) up until his death in 1975. 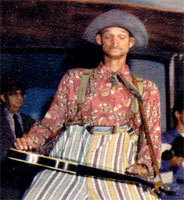 He was hilarious to watch with his outrageous outfit, such as pants made from a Purina checkerboard feed sack, no teeth and some musical acrobatics with his "biscuit board" (that was his nick-name for his Gibson lap steel). He also had suffered an accident in the late 40`s where he dropped a trailer hitch on his left hand (his bar holding hand) resulting in the loss of some fingers and some of the palm of his hand. 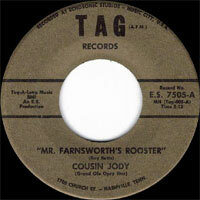 He seems to be absent from music in the late 40`s, likely due to this accident. I hope you all enjoy these crazy songs. Some are novelty songs, some parody songs and some mighty hot instumentals.